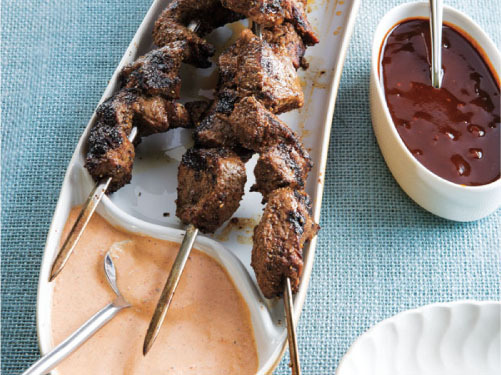 1.Soak skewers in water 15 minutes. Prepare outdoor grill for direct grilling or grill pan over medium-high heat. In small bowl, combine seasonings. 2.Evenly divide steak onto skewers; evenly sprinkle with seasoning mixture. Place skewers on hot grill rack; cook 8 to 10 minutes or until internal temperature reaches 135°F for medium-rare, turning skewers 1/4 turn every 2 minutes. Serve with Coffee-BBQ Sauce and/or Chipotle-Roasted Tomato Dip. 1.In small saucepot, cook onion in oil over medium heat 5 to 7 minutes or until soft, stirring occasionally. Add remaining ingredients; reduce heat to medium-low. Cook 10 to 12 minutes longer or until flavors have blended and sauce is hot. Makes about 2 cups. 1.In blender, purée all ingredients until smooth, scraping sides of blender occasionally with rubber spatula. Makes about 2 cups.